Investors in the Nigerian capital market should expect more gains in 2018 as the nation’s stock market will further grow next year, analysts at Vetiva Research have predicted. In its recently released report titled ‘Nigeria 2018 Outlook: Acta Non Verba,’ Vetiva research said the growth would be boosted by stability in the country’s foreign exchange (forex) market in 2017. “Despite the 2017 equity market rally driven by a partial liberalization of the country’s exchange rate regime, the Nigerian Stock Exchange remains relatively undervalued. “Now, favourable external conditions support further growth; bolstered by stability in FX and energy supply, receding cost pressure and strengthening consumer demand. “Amidst this, we project a strong equity market performance in 2018, with an estimated full year return of 15 percent-20 percent (Bear: -10 percent, Bull: 30 percent). “Meanwhile, late-2017 likely marked the end of Nigeria’s golden yield environment as the monetary authorities chart a path towards lower interest rates in the country. “Material monetary easing is expected in 2018, the intensity of which would be driven by the relative demands of economic growth and the pace of moderation in inflation,” the 169-page report stated. 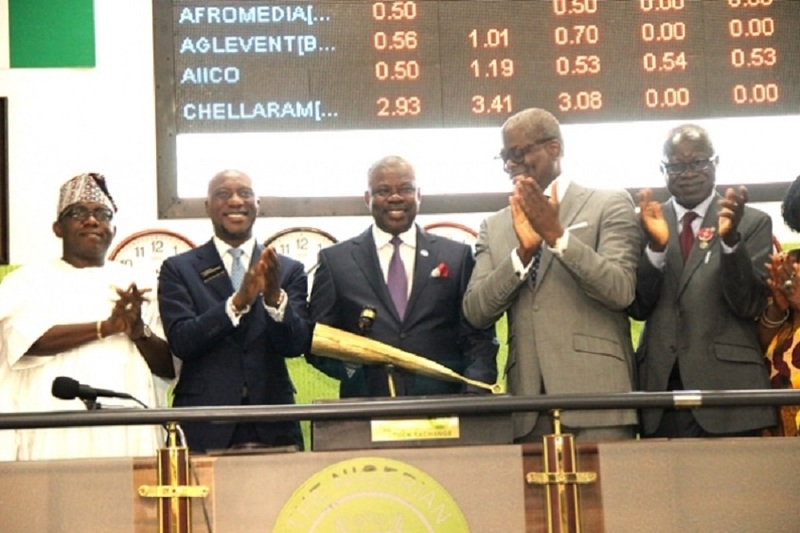 The report said in 2017, the Nigerian bourse enjoyed a very good performance, advancing 43 percent by the close of business on December 15 and chief among the drivers of this surge was the introduction of the ‘Investors & Exporters’ foreign exchange window (I&E window) which revived investor confidence and boosted liquidity in the foreign exchange market (FX). “Going forward, we anticipate continued progress on this front amidst a positive outlook for FX earnings on the back of stable oil prices and production levels. Supplementing this, recent regulation points towards a more significant role for domestic institutions in the Nigerian market which would inevitably support demand. “Amidst these, an improving economic environment (2017E GDP growth: 0.6%, 2018F GDP growth: 2.0%) would buoy company earnings and risk appetite in the market, especially given our expectation of lower interest rates in 2018,” it said. Continuing, the report said, “We expect this performance to be driven by strong growth across undervalued Tier 2 banking names and continued recovery in the consumer goods sector. “In the long run, steps to improve corporate governance and investor sophistication are necessary to achieve the desired level of market deepening and diversity. On the economy, the Vetiva report said in the year 2018, Nigeria’s Gross Domestic Product (GDP) is expected to increase by 2 percent. “Amidst brighter prospects for global economic growth and the OPEC decision to extend the output cut agreement through 2018, we expect Nigeria to pursue its growth agenda within a relatively favourable global economic landscape. “A promising revenue outlook and another record budget present a case for a year of strong fiscal stimulus – contingent on a deviation from the recent trend of delayed budget passage. The FX market, a significant win in 2017, would remain essential in the coming year. “Overall, driven by expansive fiscal and monetary policies, as well as strengthening consumer wallets, we anticipate 2.0 percent y/y GDP for Nigeria 2018 in our base scenario (Bear: -0.3 percent y/y, Bull: 2.9 percent y/y). As the Nigerian economy looks set to reach another gear, the timing of the potential political disruption from 2019 elections is unwelcome. “Despite this, we anticipate an outsized influence of the imminent elections on economic and political stakeholders as 2018 winds down, hopefully only at a minor cost to economic activities,” the report said.